I recently reported on a tasting of The Malbecs of Cahors. Whilst in the area I made time to visit perhaps the region’s most influential winemaker, Pascal Verhaeghe of Château du Cèdre. 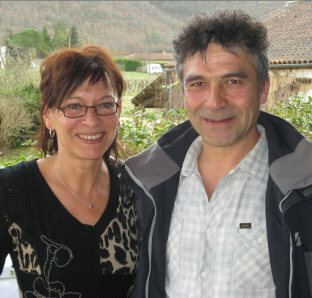 Pascal (shown right with his wife Patricia) along with his viticulturist brother Jean-Marc, has led the revival of the highest quality Cahors wines, since 1995 following a Burgundian model of identifying specific sites to understand ‘micro-terroirs’. He abandoned use of all synthetic chemicals in 2002, to be followed by full organic certification in 2009. He was also one of the first to drastically reduce vineyard yields, down to 35-40hl/ha normally. Château du Cèdre has become a role model for all of Cahors’ brightest young winemakers: all of them cite the wines and the work done here as an influence. The origins of Château du Cèdre go back to the 1950s, when Belgian immigrant Charles Verhaeghe planted the first vines on the family’s mixed farming property. But although he now runs the domaine, Pascal’s realisation that he wanted to make wine came unexpectedly: a huge motorcycling fanatic, it was during the 1980 ‘Route du Bol d’Or’, a motorcycle race though Burgundy, that Pascal visited family friend and wine producer Jean-Marie Guffens and ended up working the vintage there. Eight years later, having studied oenology in Mâcon and gained experience in Burgundy and the Napa Valley, Pascal took over the estate with his brother. Château du Cèdre’s wines are very carefully made, and in particular Pascal is anxious to avoid masking the special character of his wines through either over-extraction or too much use of new oak. 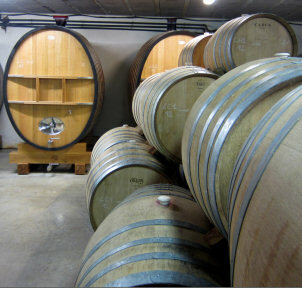 Until the year 2000 they used only 225-litre Bordeaux ‘barriques’ for ageing their wines, but since then have replaced them with 500-litre barrels and even larger casks, to reduce the impact of oak on their wines. Right: the barrel cellar at Château du Cèdre. One obvious thorn in his side is the lack of formal recognition of the specific, highest quality sites Pascal has identified within his Malbec vineyards. Though he makes no comment, it doesn’t take a genius to work out that the labelling of his top wine simply as ‘Cahors GC’ is a challenge to the authorities to grant certain proven sites ‘Grand Cru’ status, a topic of hot debate in the region. Pascal is also a great believer in his plantings of Viognier from which he makes an excellent white, but one which has to be designated as an IGP du Lot, as the PDO Cahors appellation applies only to red wines – for now. Today, Pascal also consults for a number of wineries within the appellation, and makes the wines for Domaine Marcevol in the Côtes du Roussillon. He is both gifted winemaker and passionate campaigner for the Cahors region, and his wines set a standard which he generously encourages his peers and neighbours to follow. The wines are imported by Les Caves de Pyrène. See all Château du Cèdre wines on wine-searcher. 100% Viognier from vines planted in 1988, this is fermented and aged in oak (60% new) and aged in oak for 10 months, but with no ‘battonage’ (stirring of the lees). It has a lovely sense of richness and excellent Viognier aromatics with floral and apricot clarity and lots of fat lemony fruit beneath. Oak is very much in the background. On the palate it has a delightful texture, limpid but fresh, with great clarity to the fruit thanks to the defining acidity. 89-90/100. Around £20, but does not appear to be in the UK currently. See worldwide stockists on wine-searcher. The entry level red is 98% Malbec in this vintage, the rest Merlot. It is made with fruit supplied by six growers, 80% of it organically grown. It has an easy and charming soft, earthy black fruit nose, but a sense of beingfresh and crisp too. On the palate there is spice, and it is has a serious, sour cherry and black fruit bite. Very enjoyable, a little rustic and in need of food. 86-87/100. See all stockists on wine-searcher. Delightful fruit – red fruit and a cherry brightness to this, very elegant and smooth on the palate already. Pascal says the harvest was very late in October after a cold Spring and wet autumn. A barrel sample, so not scored. From slightly younger estate vines than the ‘Le Cèdre’ cuvée, these are still around 30 years old. It is 90% Malbec with 5% each of Merlot and Tannat, and it spends two years in oak, one third of which is new. Lovely sweet, ripe fruit concentration with a lick of chocolate and espresso and hint of Malbec violets. Smooth and deep on the palate, it has real freshness and a hint of mineral saltiness, though that smoothing weight of ripe fruit and supple supporting oak is nicely set against ripe tannins. 90/100. See all stockists on wine-searcher. From an excellent Cahors vintage this has a sense of fresh coolness. Indeed an ashy, dry, mineral character is what drives this aromatically. Gorgeous palate, the dry extract of the fruit nicely managed, tannins and acids in proportion, but the fresh and juicy energy of the fruit is what drives through into a long, spicy and fruity finish. Fine wine from an organic estate. 92/100. £15.95, Lea & Sandeman. See all stockists on wine-searcher. Very good concentration here, a bit of real crunch to the acidity and tannins very supple. Fresh, juicy and vital. Excellent potential. A barrel sample, so not scored. Pascal explained that his organic methods help keep alcohol levels down, as does his regime of canopy management, that can be used to slow down ripening a little (this ends up typically with 13%-13.5% alcohol). 100% Malbec from 30- to 50-year-old vines, it is aged in barrels for 24 months, 80% of which are new. Deliciously chocolate-smooth aromas, but a sense of hot earth and minerals too. On the palate delightfully well-balanced, the juiciness and tang of the fruit is really fresh, and the framework of quite delicate oak and tannin is discreet. 91-92/100. See all stockists on wine-searcher. Back to a lovely sense of freshness and cool, Cahors earth here as well as oak and fruit. Indeed that ashy, dry, mineral character is what drives this aromatically. Gorgeous palate, the dry extract of the fruit nicely managed, tannins and acids in proportion but the fresh and juicy energy of the fruit is what drives through into a long spicy and fruity finish. 92/100. See all stockists on wine-searcher. Lovely to have a chance to taste a nicely mature example, this has such a youthful colour still, intense too. Ripe fruit drives this, immediately creamy and supple. On the palate the pure blue/black fruit is so concentrated, but creamily refined too and not at all over-extracted. Refined stuff that is sapid and lithe. 94/100. Lots more chocolaty, smooth refinement and ripeness here, great depth. On the palate real concentration, a creaminess to the texture but pure Malbec fruit expression. Obvious quality. A barrel sample, so not scored. A vintage in which Pascal says ruthless fruit selection was key: “if we’d kept just 10% more of the fruit we would have ruined the vintage,” he says. This selection harvested at just 14hl/ha in 2010 comes from 50- 63-year-old Malbec vines and was fermented in new 500-litre oak barrels and aged for 27 months. What a delicious and inviting pencil-shaving finesse to the nose, but fabulous concentration beneath with dense blue/black fruit, smoke, ash and a hint of polished leather. Such pure and concentrated fruit on the palate, supple and creamy in texture with chocolaty tannins and lovely acid balance. 93-94/100. See all stockists on wine-searcher. This is a highly unusual and personal cuvée, a “Malbec Port,” as Pascal explains it, a fortified wine at 18% ABV with 100g/l of residual sugar picked 10 days later than any of the dry red wine cuvées. It is made with real care, the spirit added in three stages to try to capture various aspects of the Malbec: “Violet, pepper and black fruit.” says Pascal. It has an arresting aromatic, very lifted, violet scented stuff, with a sense of dried fruit skins. There is a delicacy about the palate but good black fruit, a sense of chocolaty richness, but I do not find the whole picture absolutely convincing or harmonious. 86-87/100. See all Château du Cèdre wines on wine-searcher.